Did you ever see a gymnasium lined up with hundreds of dominoes? 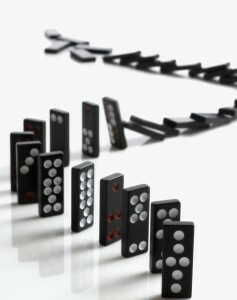 When you push the first domino, it starts a chain reaction, and all the succeeding dominoes topple, one by one. That’s what happens in your brain – there is a stimulus (a painful memory or a physical pain) and that is the first domino. Your brain immediately has an “amygdala hijack” and floods your body with stress hormones. And the dominoes are off and toppling. Stated another way, there is an event, then a feeling, then a behavior. Now, suppose you removed about 4 of the dominoes early in the sequence. It would STOP the chain reaction and the rest of them wouldn’t topple. That’s what EFT does – it halts the chain reaction by CALMING the stress center in your brain. Cognitive behavioral therapy (CBT), exposure therapy and EFT help relieve psychological suffering and can produce positive changes in the wiring of your neuro-plastic brain, as counter-conditioned memories are turned into new neural bundles. EFT’s most fundamental procedure is called the Basic Recipe. It takes elements from modern psychology (CBT and exposure therapy) and combines them with ancient Chinese acupressure. The verbal part of EFT involves remembering a specific incident with a strong emotional charge, and combining the recall with a statement of positive self-acceptance. The element of recall involves exposure. The exposure part of EFT is then paired with a self-acceptance statement that introduces the possibility of cognitive change. This counter-conditions the conditioned stress response that your body has to the memory of the traumatic event. When the conditioned response has been successfully counter-conditioned by EFT, you can still remember the stressful event, however, the memory no longer triggers a stress response in your body. In other words, after the calming experience of EFT has been associated with the memory, the memory is no longer tagged by the brain as a cue to go into fight or flight mode. The memory remains, but the emotional association is gone, and your cognitive experience of the memory shifts. And your brain starts rewiring with new neural connections that do not have the negative emotional response. So, EFT’s combination of powerful Eastern techniques of acupoint stimulation with the best Western approaches embodied in cognitive and exposure therapies produce rapid psychological shifts. Now that neural plasticity has been discovered, it turns out that there are explanations for EFT’s rapid effects that are grounded in solid science.